We provide upgrades for a variety of hardware: with buy back options also. 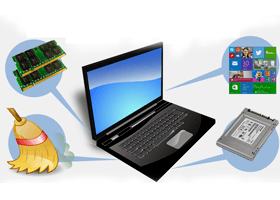 Technical Support Services (Hardware & Software Maintenance Services). → Peripherals : scanners, modems. → Data backup devices: CD Writers,DAT Drives, DLT Drives, Zip Drives, Tape cartridges. → PCMCIA network cards, modems, wireless LAN devices.